That’s a little before-and-after action of our living room. So, so, so many things have happened in between those two pictures. (Like, two years, kiddo #3, lots of hard work and not a lot of sleep.) I don’t consider the room “finished” but we’re awfully close. One of our biggest undertakings in this space was vaulting the ceiling and it’s something I want to share in more detail now that we’re living on the other (cleaner, less stressful) side of it. 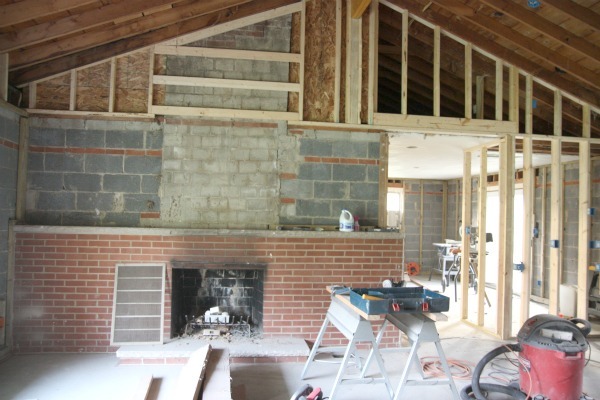 If you have been following along, you already know we removed the walls separating the original kitchen, dining and living rooms. 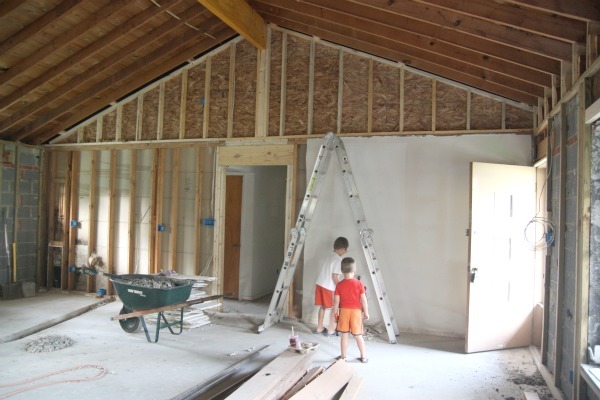 When the walls came down, part of the plaster ceiling came down, too, and it gave us an idea – a wonderful, awful idea. 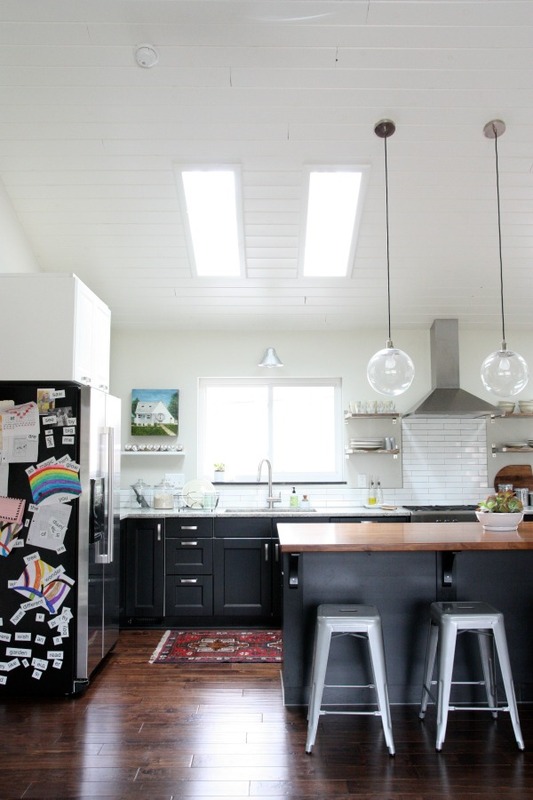 Why not rip out the 8′ ceiling in the future kitchen-living space and vault it? We knew it would be a major renovation but we also knew it would totally make the space. We hired a contractor as this project was way beyond our DIY skill set. Our contractor worked closely with an engineer at a local lumber yard to create an LVL (laminated veneer lumber) beam specific to our roof pitch, room dimensions and length of span. Like I said, waaaayyyy-haaay-haaay beyond our skill set. 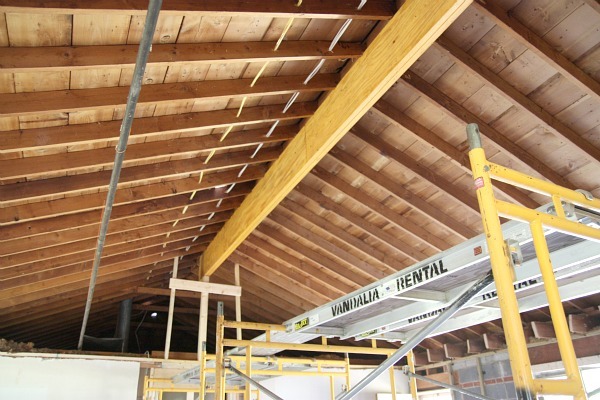 An LVL beam is constructed of multiple layers of thin wood held together by adhesive. This allows for a smaller yet stronger structural support when compared to a solid wood beam. The compact size allowed us to run electrical along the beam (for track lighting + two ceiling fans) and box it in without taking up too much space at the peak. The LVL beam was manufactured off site, signed off on by a professional engineer and installed by our contractor. These photos were taken after the structural ridge beam was installed. The fireplace wall is a block wall. A support was installed for the beam to rest on the block wall. At the other end of the beam is an interior wall – no block wall. To support the beam properly, the slab on either side of the doorway shown above was jackhammered and dug out. Footers were poured and the corner studs were replaced with glued and nailed 2 x 4 posts. The header above the doorway was beefed up as well to support the structural ridge beam. On a side note, the boys look so little! With the ridge beam installed, we were finally able to envision how the space might look someday. It felt so much bigger yet we hadn’t touched the house’s original footprint. How much did all of this cost? To have the LVL beam manufactured and installed, we shelled out $5,600. That was with us demo’ing the walls, the drop ceiling and most of the rafters. That price does not include insulation or drywall around the beam or affected walls. It does not include the cost of installing tongue and groove on the vaulted ceiling either. (You can read about that DIY project here and here.) That’s no drop in the bucket, for sure. But we bought the worst house on the street for well below $100,000 so it was within our budget and the result was a game-changer. …then my camera battery died which explains the somewhat grainy shots. Damn. We bought a crappy house for not a lot of money and vaulted the ceilings to make it less crappy. We like it here. The end. Pssst! – We made it to The Homies finals! Whaaaaat?! Click here to find out who won the epic Barcelona chair giveaway. Totally worth every single penny you spent. It completely changed the look and feel of the home. It was a seriously wise decision to open the space and vault the ceilings since the home is so small. 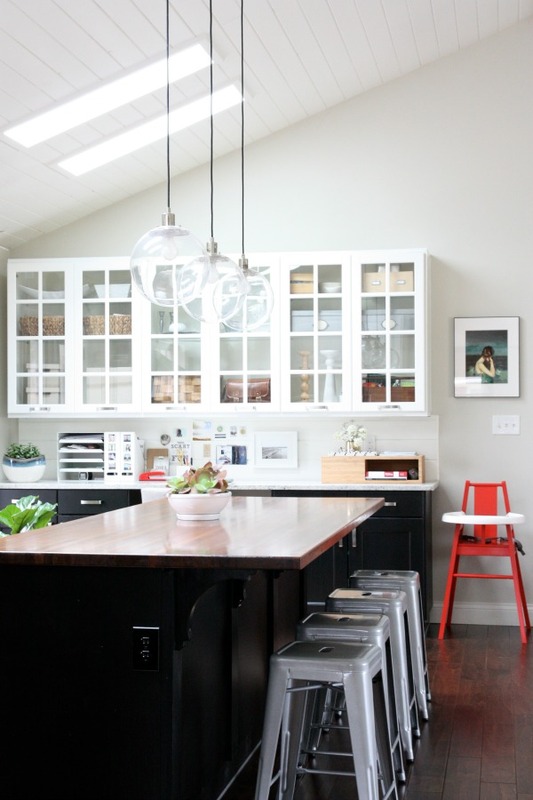 Did you ever consider incorporating the dining area into the space (like maybe where your office is) and make the other room a mud room/laundry room/workspace? Not really. We knew that we would do most of our casual family dining at the kitchen island and thought a 9′ island + another dining surface in one room might be overkill. Having the more formal dining area (even though it’s really not that formal) separate from the kitchen works for us. Admittedly, sometimes I do take my laptop to the dining table in the mudroom to work while tackling laundry at the same time. Looks sweet! I wish I had seen this pic prior to renovating my living room/ kitchen. I just installed central air Last summer. Is it still possible to vault my ceiling like yours? I have cinderblock walls and ranch style like yours. My biggest issue would be the central air considering the blower sits in the attic directly above where I would want to vault. I could have the blower moved to the other side of the house however I have no idea how the duct work would run. Absolutely stunning!! $5,600 seems pretty reasonable for the impact it had on your house and the increase you’ll see in appraised value. Good work finding a home with such great potential! Great post! I’ve always wondered about the specifics of how you decided and went about vaulting the ceilings. And a big thank you for mentioning the $$ aspect. Too often bloggers gloss over big purchases/changes like this and aren’t forthcoming about the actual cost of major renovation projects. Looks so good!! Well worth every penny spent!! I’m anxiously awaiting your kids/guest bath project – that room is next our our list, too, and I am very inspired by all your projects as your home has a very similar layout to ours. Would also love to see you add these pics to your “See Our Home” link on the side – amazing to see how much your design process has evolved from house to house! Keep up the good work – you are by far one of my faves!! That ceiling makes all the difference. But in your space full of textured neutrals (100% my style), I keep looking at the textiles–the pillows and rugs and that lovely something draped across the back of the chair. What is it? It’s a vintage kantha that I found on ebay. That chair doesn’t sit against a wall and I thought tossing a throw over the back was a good opportunity for bringing in some color and pattern. Plus, there’s always a blanket nearby on cold evenings! The seller was arteindiana. I searched for months on etsy and ebay until I found one that I liked that didn’t cost an arm and a leg. This one was ~$35. Hi there! Beautiful room! Beautiful makeover of your home! You have accomplished so much in such a short time period! Its so different than your previous home! I prefer this home’s style! 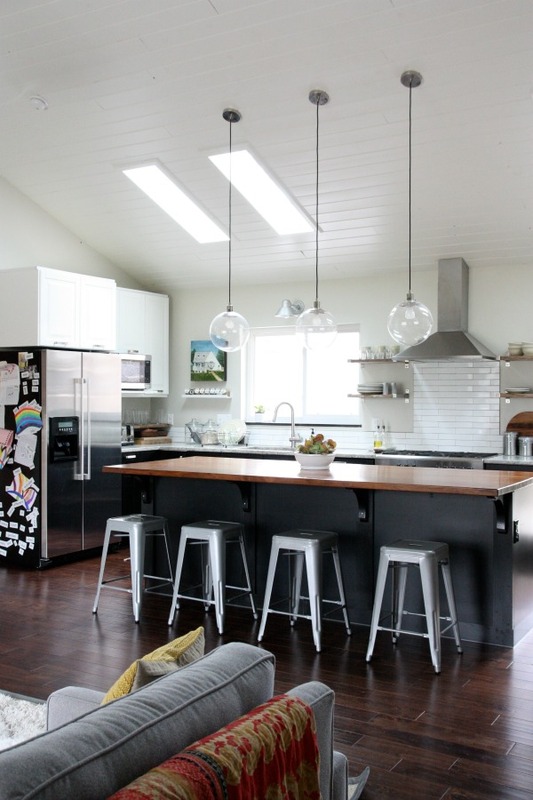 :) What color is your paint in the kitchen and living room? What color did you paint the awesome vaulted ceiling? The wall color is Benjamin Moore tapestry beige. 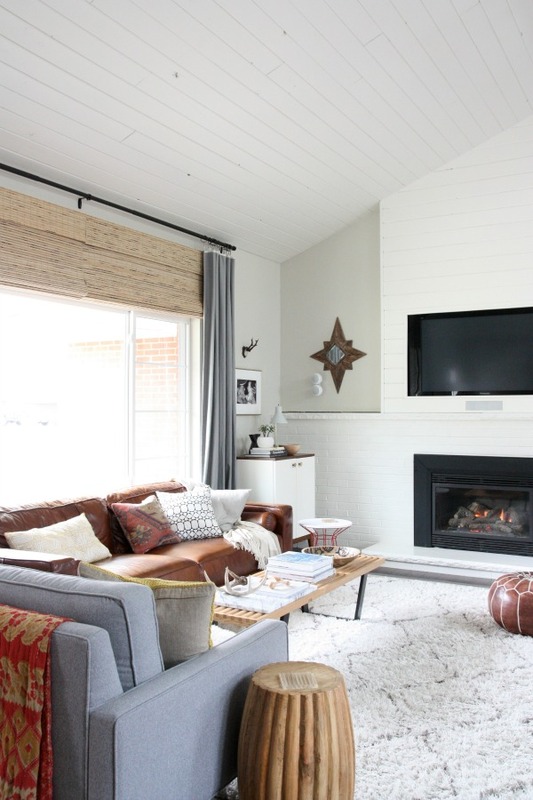 The ceiling, trim and fireplace are Benjamin Moore white dove. I love the look of bright white rooms online but found I couldn’t live with them in real life. We live in Ohio which tends to have cooler, northern light so I like having the walls and white details a little warmer than a stark, bright white. I feel like a new ceiling is one of those things someone might not ever think of changing about their space (usually wayyyyy beyond the changes one easily imagines), but your house is definitely going to keep it in the front of my mind when I’m house shopping. It’s a game changer for those rooms and well worth the money and time you put into it. I also love that you’re renewing a house that was not in great shape to begin with… it’s as if your house deserved to be well loved and beautiful and now it is reaching its (absolutely stunning) potential! Thanks for letting us tag along on your journey. What color is the stain on your wood island counter tops!?! How do you like having wood counter on the island!?! Is it hard to maintain having wood counter tops on your island!?! Was it expensive!?! It’s beautiful choice!! 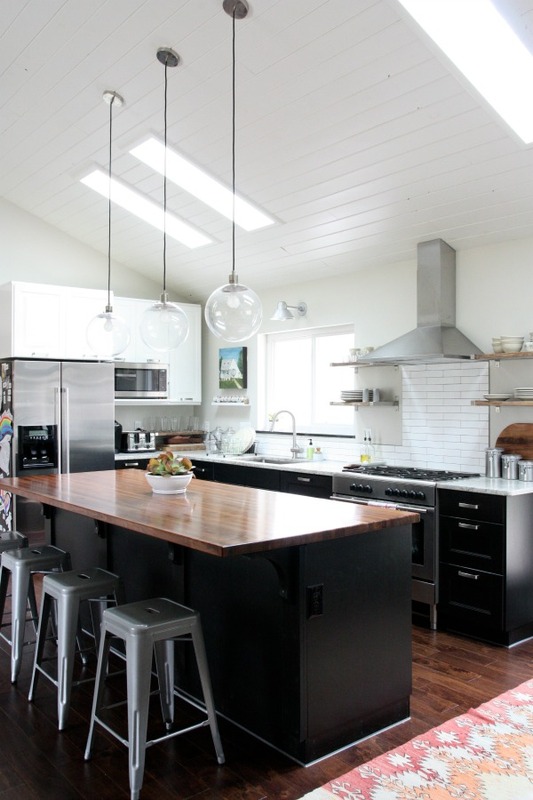 I really like the wood topped island mixed in with the solid surface perimeter counters. We eat most of our meals at the island and the wood feels more home-y than, say, granite. Everyone that visits ends up at the island eventually saying they feel like they’re at a local bar a la Cheer’s. I like that. I wipe down the island top with a wet cloth after meals. For extra sticky situations, I add a little soap, wipe and rinse. We don’t baby the walnut countertop. We use it daily for meal prep, dining, homework, crafts, etc. There are scratches in the Waterlox topcoat and maybe 2-3 deeper scratches in the wood itself (We do have kids after all.) but they really aren’t noticeable. It looks much like a rich wood bar top you would find at a restaurant. Take a closer look next time you’re out! The scratches could be sanded out and the top resealed which we might do several years down the road if it starts losing its luster. But, as is, we LOVE it and wouldn’t change a thing about it. Seriously beautiful, what a dramatic difference! Thanks for sharing the specifics (especially cost). A couple of weeks ago, my husband and I looked at a 1960’s ranch that had never been updated. It had some interesting floor plan issues and I remember thinking about what you were able to do with your house and I wondered what might be possible for this house. It turns out we’re happy where we are and the house was by no means a steal, but nonetheless I’m glad that you had this vision for your house. I think it may help a lot of people see the potential for their own homes. Thank you, thank you for this post. My husband and I are in the process of looking for a new house. 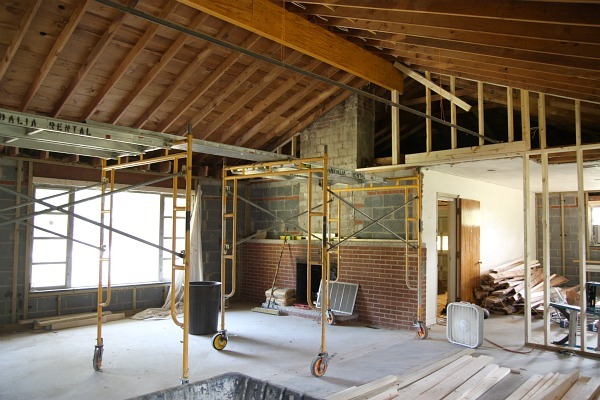 We want a ranch that needs some work – and vaulting the ceiling is something we’d definitely like to do. We had no clue how much a renovation like that would cost. I’m sure it varies by region, the space and the amount of DIY work, but this at least gives us a ballpark to keep in mind. 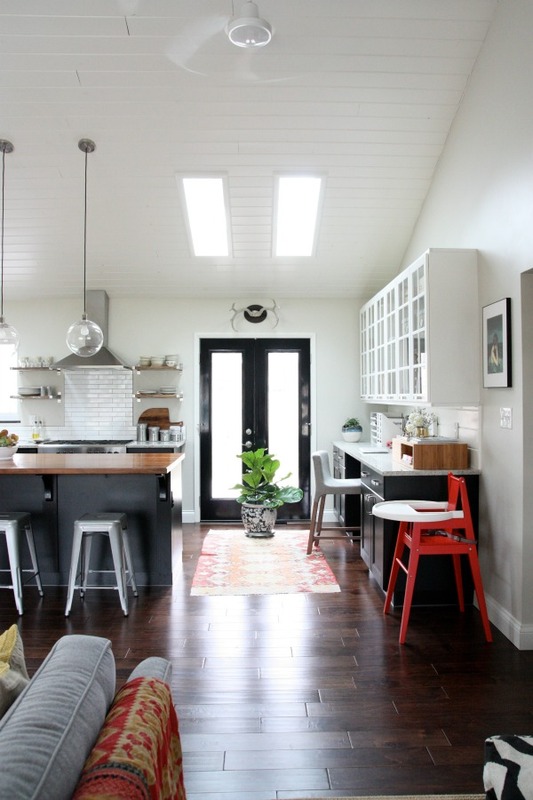 Your house looks beautiful – so open and airy! Oh wow! I always wanted to know the cost, but felt it was so rude to ask! 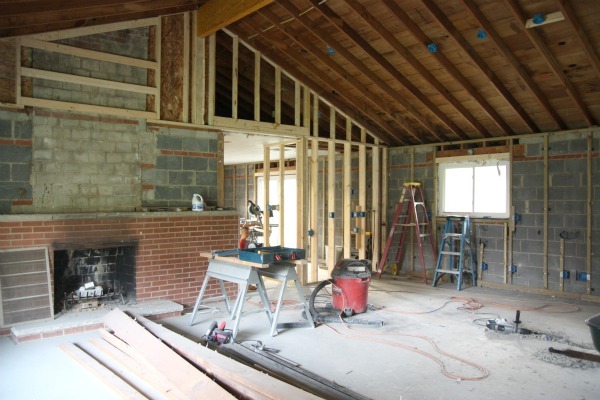 We have a ranch and would LOVE to vault our main living areas, instead of going through all the trouble to tear down one load-bearing wall. Ever since I saw the transformation the vaulted ceiling did for your house, Chris and I have been trying to figure out a way to vault ours. But the way the ceiling is structured, we aren’t getting any estimates under the $30,000 mark! Looks like we’ll be working with our 8 footers. Haha! Amazing transformation and worth every penny. I am jealous that you were able to find a house for under $100,000! In my city ( Vancouver BC) you couldn’t buy a tear down for under $500,000. And even that is a reach. 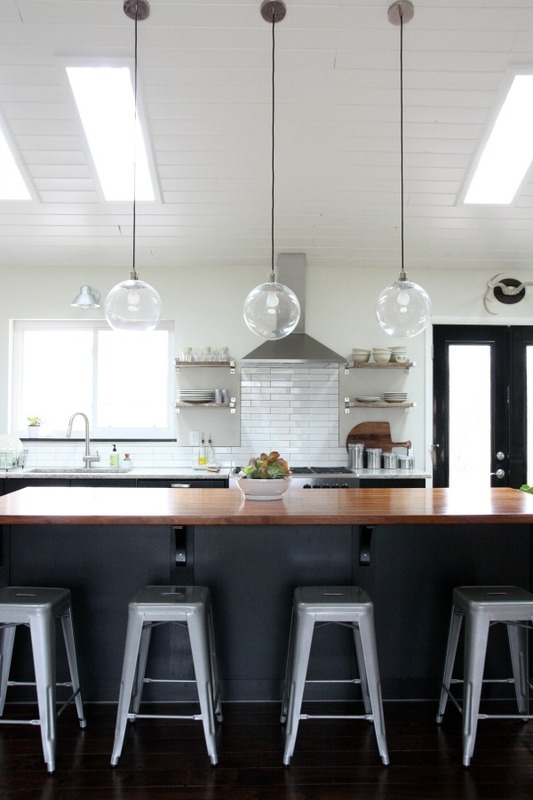 Your home is inspiring and I look forward to reading your blog every day. I absolutely love the transformation and it was worth every penny! I just verbally exclaimed ” I want to marry this renovation” and my husband says he now feels rejected because he can’t compete with it! Ha–you made it way less crappy, and so beautiful. The end. 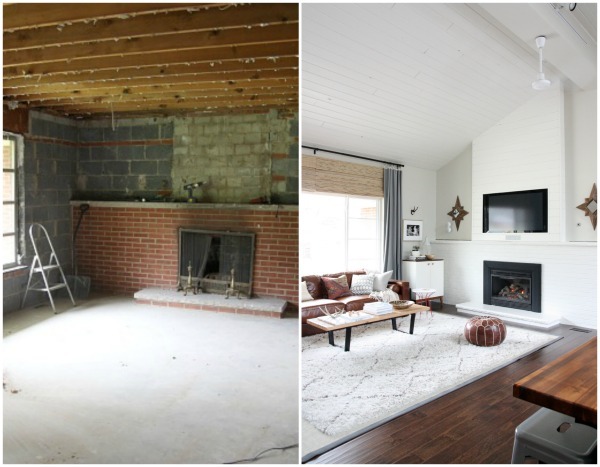 Fun to see the before/afters and also cool to see price points. AMAZING. Simply amazing!! Totally changed the space. Love it! Very good to know. I always wondered how much something like that would cost. We thought about doing the same thing in our own home, but ruled it out considering we don’t intend to live here for too long. Totally unrelated, the succulent planter on your island is very pretty. I tried my hand at making one a few months back but almost everything in it is dead now, which is probably because of the lack of adequate drainage. I think I’m going to try putting together another one, and blog about it if I do. I’ll credit you, of course. Thanks for the inspiration. I actually found your blog when it was featured on Apartment Therapy and I was incredulous about your claim of saving money (vs your last home) with all these renovations. It’s been really fun watching this all come together. Such a beautiful room! Great decision about the ceiling- worth every penny. I’m a newish follower so I’m liking when you go back through the renovation posts. I love the vaulted ceiling! Even though I documented our renovation in real time, those posts are buried. I think it’s fun (and hopefully helpful) to go back and see what exactly went down to get to where we are now. It’s been a long haul! I’ve been waiting on this post forever! The vaulted ceiling totally rocks. Our ranch house is nearly identical to your home’s original layout and from the same time period. 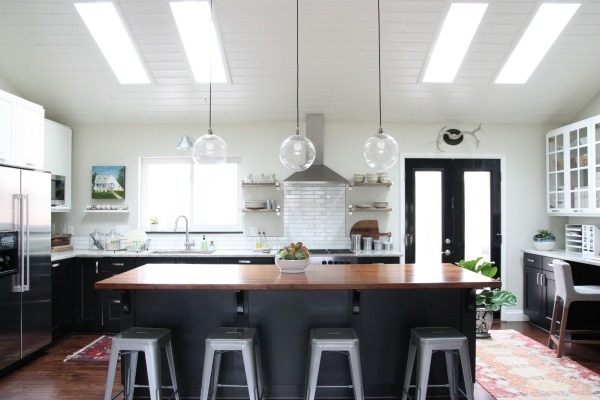 If we had it all to do over again, we would have done the exact same thing, but we renovated the kitchen 5 years before I found your blog so vaulting the ceiling won’t work for us now. Anyways, love, love, love it! We’ve never had any plans to add on…even after we found out we were unexpectedly expecting #3 during renovations. We’re all for making this house with this square footage work for us as long as possible. We have financial goals which include being mortgage free within 3 years. This house is a means to that end. We haven’t thought too much beyond that point. Thank you so much for this post! My husband and I are looking for a house to buy and are specifically looking for houses with smaller footprints. I’ve fallen in love with your home and am so inspired by the idea of vaulting the ceiling; it makes those smaller spaces feel so much bigger and brighter. Beautiful! Thanks especially for sharing the cost; while I do love some dreaming inspiration, I also like knowing what’s practical for us to do and what might be a wee out of budget. wow amazing and your style has definitely evolved. cleaner lines and more modern. incredible! 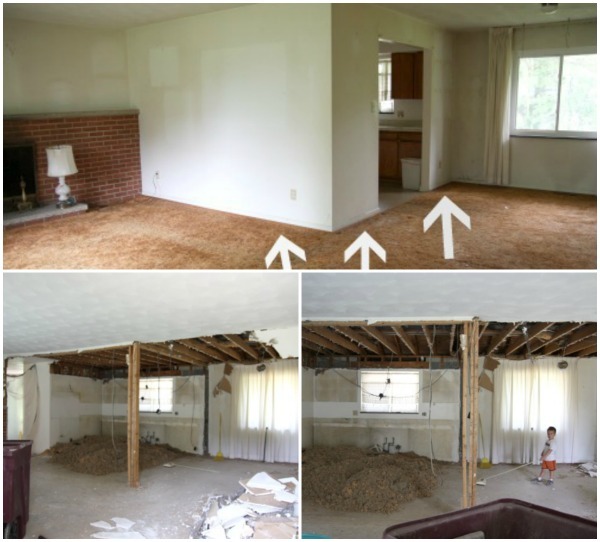 it completely transformed your home, it was meant to look this way! How much in total do you think you spent on the ceiling reno? I love this part of your remodel! We have a very similar Ranch built in 1964. What size LVLs did the contractor use? double 14″? 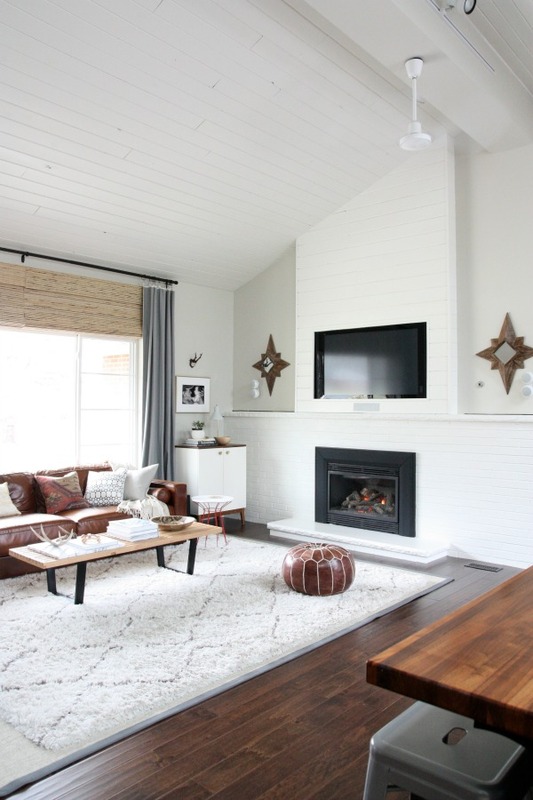 I love this space and completely believe that vaulting the ceilings was the best bet. We also bought the ugliest house on the block by way under $100k. We are slowly but surely making it worth our investment. I’ve always believed in buying the ugliest house in the best location. This investment is making a fab home for your family and an even better looking house for all of us to inspire to! I love all the information and beautiful pictures. Your house looks gorgeous! This is hands down my favorite House Tweaking post ever. This post is amazing, the work you have done to that ranch is very beautiful…. Well done, I bet you love it. I am shocked. I just love the new angle you’ve take photos of your living room from – the corner of the island, I’m guessing? Brilliant!! I admire this kind of design ingenuity the most. I’m always looking to simplify, down-size, and not be hampered by a mortgage so this story is quite inspiring. We have three kids (ages 24, 18, and 14) and have always lived in small houses that required ingenuity and creativity. This allowed me to stay home with the kids and it also kept us close in the house which I highly recommend as it encourages conversation and togetherness : ) Our current ranch does have one feature that I love – a door between the living space and hallway which leads to the bedroom. If I want I can close this off when we have company or I need some quiet alone time. Anyway, thanks for the inspiration! Steve and I have talked about adding a door there too! Not sure if we’ll actually do it but the purpose sounds great. Our ranch house has a pocket door between the living room and hallway. It was a welcomed surprise. Wow! That looks so great. Your house is really similar to ours (we have vaulted ceilings as well) Only we have this terrible off centered brick fireplace I have no idea what to do with. I can’t believe what you paid for your place. We got a steal of a deal on our house (similar size needs updating plus new windows and roof and paid close to 350 k for it. I can’t belive what houses go for in our city. Thanks for revisiting this – it’s definitely the aspect of your renovation that fascinates me the most. Do you know, is the LVL beam all one continuous length? In one of the photos it looks like there might be a seam in the middle. If it is all one length, how did they manage to get it into the house? Thank you so much for this post!! That was very helpful for me- I followed along throughout the renovation process (by which I mean I went all the way back to when you bought The Underdog and read every since post since then), but the ceiling is my favorite part. I definitely want to try something like this in our next home, and you’ve given us lots of great information to go off of. Thank you! looks awesome. what is the size of the room? Roughly 25′ x 21′. Almost a square. Yay, you answered my question! And a cost breakdown too! I would’ve thought it was so much more, but you guys did a LOT of your own work (demo PLUS that amazing ceiling). Just an amazing transformation. Now over to vote for you on the homies… good luck! That’s an amazing change! It looks beautiful. Random question — what kind of high chair is that in the background?? It’s Ikea’s BLAMES high chair in red. Dana, wahooo i’m so excited to have discovered your site! Vaulting that ceiling really was a game changer, huh? Adding space at the top totally invigorated the space, like i’d NEVER want to leave that kitchen! 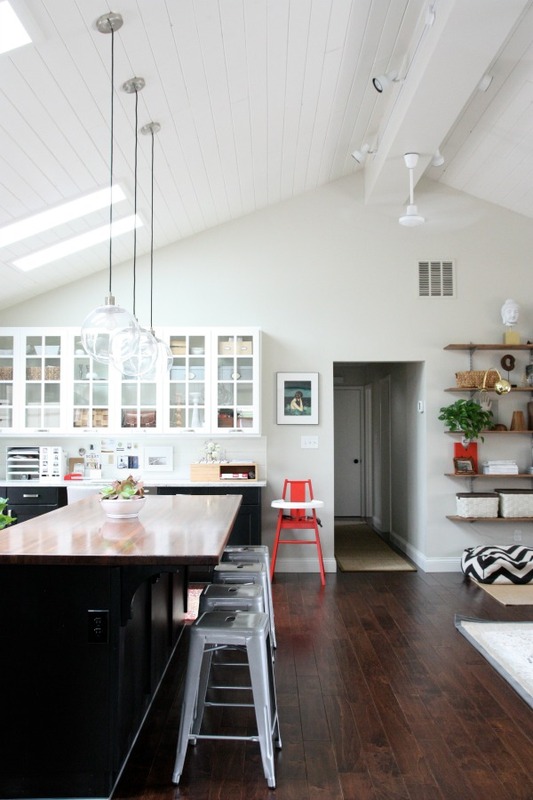 Love your vaulted ceilings! We too bought a ranch which we are remodeling and we would love to do something similar, but our air handler is up in the attic and would have to be moved to another location ($$$) and HVAC ducts would have to run across the ceiling somewhere. Maybe I overlooked it in your post, but how did you heat/cool this room? Where are your HVAC ducts? Thanks! Our ductwork runs through our slab (no basement here). All we had to do was run a return air duct and install a vent up near the apex (it’s just above our DIY shelves). My dad is retired from sheet metal and HVAC work, so he actually made the new ductwork for us. So grateful! Gorgeous! Quite the transformation! I am wondering if you can tell me where you got your family room rug? Thanks in advance! The vaulted ceiling, and indeed the whole room, are fabulous! My son bought an “ordinary” ranch bungalow that had been refurbished, and the kitchen/dining room ceiling had been vaulted. The effect was remarkable and made a small square footage home into one that feels airy and spacious. I’m certainly going to look at doing this if we can find the right house to rehab, and have bookmarked your blog for inspiration. Thank you! Thanks for the summary! I really love your west elm pendants. Do you think they give enough light in the evenings on their own? Considering 3 of them over our dining room table, which is a pretty dark room. Thanks! Each pendant has a max wattage of 60W. We find the three of them to be more than enough to light the island in the evening. Our pendants are on a dimmer and we hardly ever turn them all the way up because they’re so bright. They don’t really have a shade to diffuse the light so everything comes through. Maybe try plugging in three 60W bulbs into various lamps minus shades in your dining room and see what result you get?? It might give you a good idea of what to expect from the pendants. I always suggest dimmers in dining rooms, too. Changes that took this space from “eh” to “oh, WOW.” I am lovin it! This is so swoon worthy! I love it! 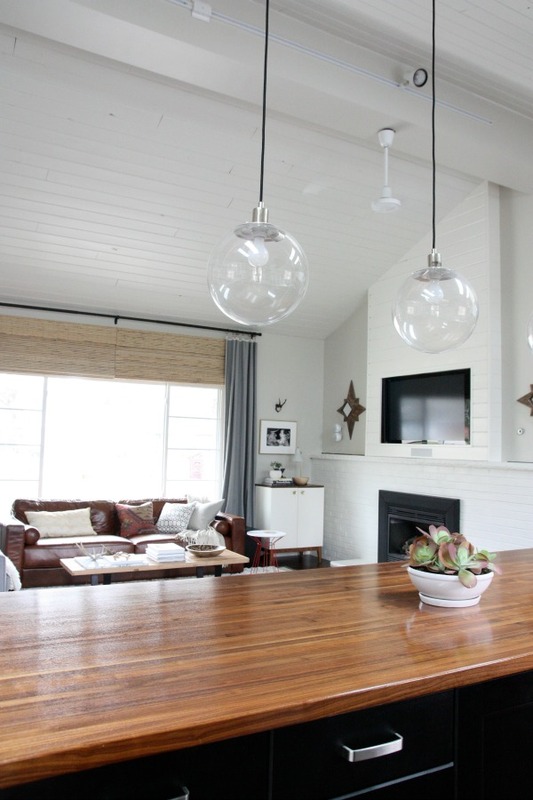 What a great way to create an open and airy feeling! It’s beautiful! Nice work! I’m new to reading your blog, so I apologize if you’ve stated this already but #1 where is your sofa from?? and #2 what brand is the high chair you have? #1. Sofa is Soho Fine Elements in leather. Try googling for the best price. #2. High chair is the BLAMES in red from Ikea. Love what you,ve done. My husband and I not so handy as your family bought a very similar style ranch. We are planning something similar but will likely go with pros all the way. Any ideas on what costs would have been if you had gone with pros? Where did you order your kitchen cabinets and island? Unfortunately we were in a multiple offer situation, so we had to bump up our price so we are hoping to be as frugal as possible, while making sure to not cut important things out! We installed it ourselves but Ikea offers installation and there are handymen / contractors in our area who install Ikea kitchens as well. Check with Ikea for pricing. I have no idea as we always planned on DIYing it. I thought they might be IKEA. They look great! And your post is super helpful. I hope we will be able to go the same route in our space. I imagine we will be able to at least assemble the kitchen ourselves which should save some $$ Thank you for the help and pointing me to the right post!